You will find the Emails Settings on your WordPress admin area navigating to the GamiPress menu -> Settings -> Emails tab. 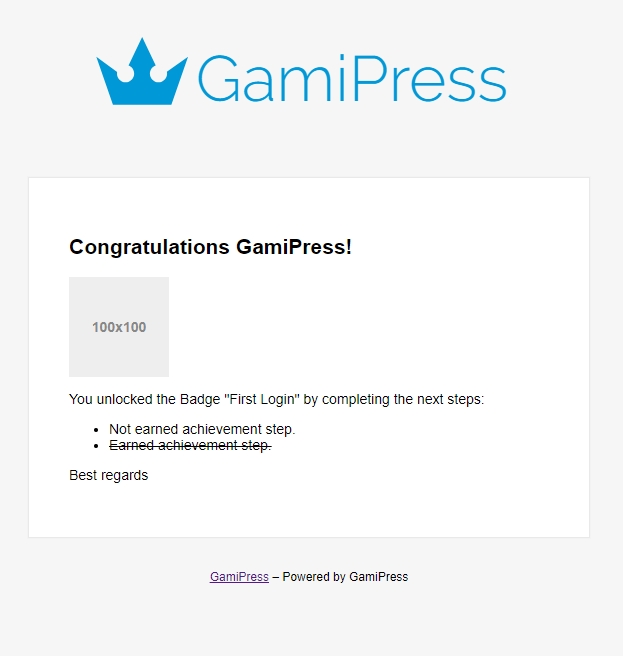 The email template to be used on all emails sent by GamiPress. Upload, choose or paste the URL of the logo to be displayed at the top of the emails (not displayed in plain text template). Name to display as sender. The email address that will be used as the “from” and “reply-to” address. Text to be shown at email footer. From the next box you can setup the content to send for each email type. Also, you can disable each email type as well as to preview them or send a test email to your email. For each email you have some tags that will be replaced dynamically for each user and each email type.